I know how to make crêpes, however they have some tendency to be a bit ugly aesthetically speaking. What can I do to improve my crêpe-fu? Is it possible to achieve the prettiness of the first picture? The trick, according to a French roommate from college, was thin batter temperature and a well (clarified) buttered pan. The batter should feel almost too thin. I always thought that the batter was perfect and she would thin it just a little more. The pan should be at just the right temperature (this will vary stove by stove). Your photos look like the temperature could be a little lower, but only just! The way she kept her pan perfectly buttered was using clarified butter, and used half of a yellow or red potato on a fork (think a nice waxy potato) to spread the butter. This allowed just the right amount of butter into the pan. Not the answer you're looking for? Browse other questions tagged pancakes crepe or ask your own question. 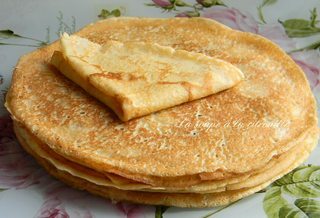 How to make thick and fluffy pancakes? How many eggs in a Mille Crêpes Cake? How do you make Paillets Feuilletine? 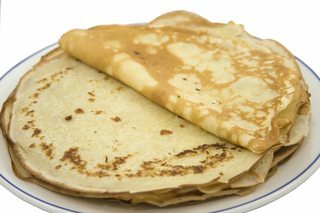 How to make crispy crepes?